THE vision that Rajasthan invokes in most is one of magnificent, awesome and impregnable medieval fortresses. in fact, the most attractive features of the Aravalli hills in the state are its fortified cities and palaces. Some forts have been built on a hill overlooking the city, as is the case in Alwar. At Amber and Bundi, the palace stands on the hillside, while the fort is situated on the summit. Then there are the towns of Kumbhalgarb, Chittor and Ranthambhore, where the entire settlement is sheltered within the fort. These forts could support human habitations only because they had elaborate water harvesting systems. Invading armies would sometimes lay siege to these forts for months; during such times, there had to be enough water inside the fort to sustain its defenders and inhabitants. Builders of both the Chittor and Ranthambhore forts made excellent me of the natural catchments in the forts created by undulating hilltops. Some areas were also contoured to facilitate collection of run off. For drinking purposes, kunds and baoris (stepwetls) were built below talabs (tanks). Stone quarrying for fortification or building purposes was done in such a way that the pit could later be used as a reservoir. Some of the reservoirs were designed and built to facilitate the movement of water from one to the other. 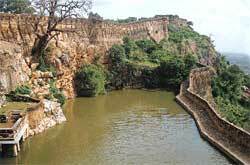 There are no records of how many people actually lived inside Chittor fort, though a rough estimate can be made. According to historians, 13,000 women once committed jauhar - a unique practice of the women of Mewar who used to immolate themselves on funeral pyres rather than submit to the enemy. In another instance, 32,000 Rajput warriors died. Hence, it can be assumed that at least 50,000 people lived in the fort at a single time, along with a large number of elephants and horses. 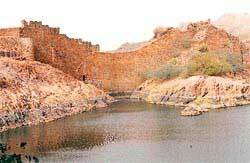 Historical records speak of 84 water bodies in the fort. Today, not many of them are visible; those that did not have stone or masonry lining, have completely disappeared. The beds of the reservoirs have been brought under the plough. However, not all is lost. At least 22 major water bodies still exist, which include talabs, kunds, baoris and wells. Among the talabs in the fort are the Chatrang Mauri talab, which is the biggest, and Fatehji-ka-talab, Padmim talab and Bholiya talab. The Khatan baori, Surya kund, Ratneshwar kund, Kukdeshwar kund, Bhimlat kund and Bhirn Godi are the well-known kunds and baoris. All talabs in the fort have natural catchments. The builders of Chittor not only harvested surface water but also the ground seepage. Kunds and baoris are located below the talabs to harvest seepage. Thus, Surya kund is located below Kala nada; Khatan baori below Fatehji-ka-talab; and, Bhimlat kund below Sukadiya talab. Hence, even if a talab dries up, its seepage could still be harvested from the kunds and baoris. The Gaumukh spring is formed due to the seepage from Hathi kund, which in turn is recharged by the Fatehji-ka-talab. The source of Kukdeshwar kund is the seepage of Mahadevra kund, which is recharged by Ratneshwar kund. This kund, on its part, is charged by the Rathodiya kund. About 5,000 people once lived in the Ranthambhore fort, today situated inside the famous Ranthambhore National Park. Water for so many people had to be harvested in the fort itself Even in peace time, it was too cumbersome to lift the water from below the fort. In Ranthambhore fort, water was, for all practical uses, taken from wells next to talabs which recharged the wells. The water of these talabs was of better quality. Water bodies in the fort are well distributed, so that no one had to walk long distances. All major structures in the fort are situated around these water bodies. The fort even had openings in its battlements from which water could be released to ward off the advancing enemy. During war, boiling water was thrown onto the enemy from the ramparts. According to R L Mishra, author of Forts of Rajasthan (Kutir Prakashan, Mandawa, Rajasthan, 1985), "There were five big tanks in the fort which were always kept full of water. Whenever the fort was threatened, the big holes provided in the bottom of these tanks would be opened, and the gushing torrent of water would weep away the invading army gathered before the Nolakha gate." It cannot be denied that by modern standards, there are some drawbacks in the traditional system. In modem times, it is difficult to allocate such large land masses for storing water. Moreover, a clean and unobstructed catchment is needed to supply unpolluted water, and the state of catchments today belie such hopes. However, modem engineers still have a lot to learn from the ingenuity of conception and design that is the hallmark of Rajasthan's 'water strongholds'. JODHPUR was founded in AD 1495. While selecting a site for locating the city, its builders must have given serious thought to its water potential and strategic situation. The Chonka- Daijar plateau, an important physical feature of this region, serves as a water catchment for 50 functional surface water bodies like nadis (village ponds used for storing water from an adjoining natural catchment during the rainy season), talabs (ponds), tanks, canals and lakes, and indirecItly, for about 154 groundwater bodies like wells, baoris and jhalaras (both step-wells). Jodhpur's surface water bodies are primarily natural, but they have been improved by local people over the centuries. In the past, these water bodies - many of them more than 500 years old - used to be the main source of water for the city, also providing water through seepage to the wells, baoris and jhalaras in their respective areas. Regardless of who built these water bodies, they eventually became common property for all practical purposes. Unfortunately, the construction and development of water bodies came to a virtual halt around 1897-98, when a public water system supply was introduced for the first time. People's initiatives could maintain the sanctity of the old water bodies and canal system only until the 1960s, after which the collapse came. Most of the water bodies are now in a highly mutilated, irrecoverable condition. A 1989 survey conducted by Jodhpur's School of Desert Sciences (SDS) was successful in locating 229 different water bodies; of these, 75 were surface and 154 groundwater bodies. To maintain the existing (and usable) surface and groundwater bodies in their present forms, at least five per cent of the total water expenditure of the city needs to be diverted towards their management and repairs. It is interesting to note that during water shortages, 66 of the 107 functional groundwater bodies are still used by the public health engineering department (PHED) to augment the city's water supply. The region's ancient surface water bodies represent not only excellent feats of architectural and engineering design, but also a high degree of community sharing, and social, moral and religious values built around a desire for 'water for all'. These values preserved and maintained the water system without any written code of conduct for many years. However, with the introduction of the public water supply system, people began ignoring their water heritage. Nadis: The SDS survey found 25 nadis in and around Jodhpur. Of these, five are located inside the city and 20 outside. The oldest nadi on record is Jodhnadi, built in AD 1458. Unfortunately, one-third of these nadis have been badly polluted because of the indifference of local people, catchment destruction and urbanisation. Six nadis, including some of the oldest ones like Range-ki-nadi and Pritaro-nado (about 450 years old) have been completely lost. Most of Jodhpur's old villages had their own nadis; water availability from a nadis ranged from two months to a year after the rains. Talabs: A talab is a water reservoir situated in a valley or a natural depression. The SDS has traced 40 out of the 46 talabs mentioned in old records. Of these, eight are located inside the city and are 300-530 years old, the oldest being Ranisar, constructed in AD 1460. The Chankelao, Phoolalao and Naya talabs have been lost predominantly due to heavy urbanisation. A public park has come up on Phoolalao talab. Gangelao talab, a maior source of drinking water until 40 years ago, has now become a source of disease with the accumulation of dirt, filth and garbage, because of local residents diverting their sewage lines into it. Today, the only safe talabs - whose waters are still used by the people - inside the city's boundaries are Ranisar and Padamsar. However, urban activities are already eroding their catchments. The 32 talabs located outside the old city boundaries Are between 105 and 600 years old. Of these, 11 have been completely lost due to urbanisation and industrialisation, while the catchments of another 11 have been partially lost, with little chance of revival. In fact, the SDS found only two, the Bijolai and Arna, with fully protected catchments. Only these two hold water for more than four to six months a year, even during years of normal rainfall. Tanks: Provided with canals to bring rainwater from the catchment areas on the outskirts of the city, the five tanks of Jodhpur are of relatively recent origins. The oldest, Fatehsagar, was built in AD 1780. Three of these tanks are located inside the city (Fatehsagar, Gulabsagar and Baiji-ka-talab) and two, outside (Mansagar and Paota). Of these, Baiji-ka-talab and Paota have been abandoned, while Mansagar has been destroyed. Baiji-ka-talab and Mansagar now receive sewage and polluted waters from adjoining colonies. Gulabsagar and Fatehsagar are also polluted. Their rainwater-bearing feeder canals have been turned into drains, with residents having opened their sewage lines or dumped garbage into them and encroachirig their banks. However, these two tanks can still be restored if their feeder canals and catchments are protected. Lakes: Jodhpur has five large lakes located on the outskirts of the city in a more or less natural setting. The oldest is Balsamand, constructed in AD 1126. This lake, along with the other four - Lalsagar, Kailana, Takhatsagar and Umedsagar - can hold about 700 million cubic feet (m cu ft) of water at a given time, which can support about 800,000 people for eight months. But nowadays, even during years of normal rainfall, these lakes do not get adequate water because of the poor state of catchments and canals which carry rainwater to them. The Kailana-Takhatsagar, the largest city lake, is linked to major canals like the Chota Abu, Kaliberi, Keru and Nadelao, and supported by several smaller ones. These canals have been mutilated and blocked by rubble over the years due to mining activities in the catchment area. Balsamand is linked to the Mandore-Fedusar canal, which brings rainwater from the Balsamand-Mandore hill ranges. Until 1875, Balsamand was the main source of water for a sizeable population of the city. Its water was carried to the Gulabsagar tank in the heart of Jodhpur through an open canal. The city's water supply was augmented when Kailana and Takhatsagar lakes were constructed and their waters carried to Gulabsagar and Baiji-ka-talab through a pipe in 1905. This was followed by the construction of Umedsagar to support the inhabitants of the western part of the city. At present, largescale mining operations are going on in the Balsamand catchment area. With the Balsamand lake not receiving enough water, the decreasing water level has rendered about 50 orchards unproductive. Eleven streams that support several forms of wildlife and cattle populations all along their lengths, also run on the out-skirts of the city. Until recently, all of them had flowed round the year. Now, seven of them flow only during the monsoon months, thanks to extensive mining and the digging of tube-wells. Canals: Jodhpur is perhaps the only city in the country where an all-out effort was made to conserve every drop of rainwater. To achieve this, every catchment and hillock was drained by canals, a network of which had swamped Jodhpur by 1886. The SDS survey revealed a total canal length of about 85 km, capturing water from about 13,500 ha of catchment area. These canals carry water to five lakes, two tanks and two talabs. The Balsamand feeder canal is still intact, except for the garbage, stones and sand that have accumulated in it at some places. The greatest danger to it is from indiscriminate mining along its banks al several points and road construction over it at two places. Though the canals supplying water to the Kailana and Takhatsagar are functioning, they have been blocked at several places. Indiscriminate mining has had an adverse impact on the Kaliberi, Keru and Umedsagar canals as well, while the Gulabsagar and Fatehsagar tanks are polluted, with residents of the city having opened their sewage channels into them and encroached their banks Gulabsagar and Fatehsagar canals are reeling under urban pressure all along their routes. The SDS survey suggests that if measures like urgent repairs, clearing of encroachments and stopping mining are undertaken, an extra 200 m cu ft of rainwater can be supplied to Jodhpur. The groundwater bodies of Jodhpur - wells, jhalaras and baoris - were conceived to tankers. But ensure easy and regular water supply to these villages, neighbouring areas. Each collects the subterranean seepage of a talab or lake located upstream. Local philanthropists were instrumental in building many of these bodies; the wells were dug essentially to enhance drinking water supply, while baoris and Jihalaras were meant for washing and bathing. Wells : Old records list some 125 open wells in different parts of the city. The SDS has traced 98 - 41 inside the city and 57 outside. The Jeta bera and Chopasani bera are the oldest. Of the wells surveyed, 74 are still in use, 23 have been abandoned and one has been lost. Among the operational wells, 53 are used for drinking water and 13 for irrigation and cattle. The 24 wells which have been abandoned or closed have either polluted water, or have none. The last community wells were dug around 1870, after which their construction came to a virtual halt. This was directly related to the increased availability of water from other sources. However, 23 old wells are still being used by the PHED to maintain the city's water supply. About two or three per cent of the city's population still uses well water for drinking. It appears that there was some link between the wells and population growth of the city and its spread; the maximum number of old wells are inside the city's perimeters, where the concentration of population is the most. Baoris: Jodhpur is a city of baoris or community stepwells. Shallower than wells and older than other water bodies of the city, baoris can hold water for a long time because of almost negligible water evaporation. The SDS surveyed 45 baoris - 16 inside the city and 29 outside. Mandore baori, the oldest, was constructed in AD 784. Among the other old baoris are Bheru baori, Chand baori, Jagu baori and Idgah baori. About 30 baoris still hold water, 20 having potable water. Although traditionally baori water is not used for drinking, waters of Rameshwarji mandir baori, Achalanth baori, Shiv baori, Barli baori and Nathon-ki-baori are regularly used for drinking and for offerings in temples. Bathing and washing is prohibited in these baoris. While the PHED, on its part, is exploiting the waters of 11 baoris, hardly any effort is being made to improve their conditions; 11 more have been abandoned and two totally lost. Jhalaras: The SDS was able to locate all the eight jhalaras of the city - two inside the city and six outside. The Mahamandir jhalara, which is more like a baori, is the oldest, having been constructed in AD 1660. Kriya-ka-jhalara and Mandore jhalara are reported to be about 400 and 500 years old, respectively. Of the eight jhalaras, four have been abandoned, the PHED is using two for water supply and the Nolakha jhalara is being used for irrigation. 1halaras provide breathtaking and exquisite examples of architectural design, and need to be protected - both as the city's heritage and as unique water bodies. It is obvious that a number of steps need to be taken urgently to stop further destruction of Jodhpur's extraordinary water supply heritage. Mining and all urban and industrial activities in catchments must be stopped. Agencies like the town planning department, urban improvement trust and the local municipality should not be allowed to interfere with forest areas and catchments in the name of urban expansion. The forest department can undertake afforestation of catchment areas, and the mining department should rehabilitate the mined areas in the catchments. Rejuvenation of the long-neglected nadis, talabs, tanks, wells, baoris, jhalaras and canals by cleaning and repairing them, is another necessity. Legal support will be needed to remove unauthorised constructions and encroachments in catchment areas and canals. However, for achieving all this, complete public support is the prime prerequisite. Therefore, public awareness campaigns will be needed to educate the people about the need for water conservation, and the preservation of the city's unique heritage of water harvesting. KIKRUMA is a nondescript village in India's remote northeast, inhabited by the Chakhesang tribals. Located at an altitude of 1,270 metres (m), 13 km from Pfutsero town in Phek district of Nagaland, the village comes under the town's rain-shadow. The entire village is situated on a flat ridge bounded by two seasonal rivers- on the south by the Seidzu, and on the north by the Khuza. Necessity is the mother of invention, and the Chakhesangs illustrate the dictum fully. Beset by a perennial shortage of drinking water brought about by the village's location as well as the seasonal nature of its rivers, they have devised their own time-tested way of cultivation called zabo. Also known as the ruza system locally, zabo means impounding water. According to a report in the Indian Joumal of Hill Farming, this indigenous system is "a combination of forest, agriculture and animal husbandry with a well-founded conservation base, soil erosion control, water resources development and management and protection of environment". Over the years, the Kikruma community has evolved an elaborate water harvesting arrangement whose various comments interface to produce an efficient land-water management system. Protected forest lands, on hilltops act as catchments; ponds are dug in the middle where water is harvested through inlet channels from the catchment area; and, terraced fields are laid below them. The ponds are Kikruma's unique feature. Spread all over the village, they numbered about 150 in 1995. They are constructed in such a manner that surplus water from one pond flows down to the pond below. Water is released from a pond through an opening at its lower end, which is otherwise blocked by a piece of wood. The ponds dry up by March or April and this dry period is used to repair them. At one site close to the village, the existing pond is owned by five persons who cultivate the adjoining fields. Two channels, each over a kilometre long, drain water from the surrounding areas into the pond. The villagers have made the channel compact by hammering its base, thereby reducing water percolation. When water is required for paddy transplantation, they dig a hole at the base of the pond. Kikruma's water conservation method saves even the water flowing along the steep approach road to the village; it is then directed to the ponds and utilised for irrigation. The villagers build a series of speed-breakers on the road, which block the runoff at about every 10 m. The water drains into a channel along the roadside, and takes a right-angle turn when blocked by a stone. From there, it is channeled into the ponds. The sharing of this water between different families or clans is through mutual negotiations. Sliced bamboo strips aEe also placed along the hill slopes to drain water into a pipe that goes below the road and empties into the channel on the other side of the road, before being diverted into the fields. In terrace cultivation, after the water reaches the fields, human feet churn the soil into a thick slush. Water flows from one plot to the other through passages which-arc designed to retain about 15 cut of water in the fields; the same arrangement exists in the last plot before the excess water is let out. In terrace cultivation, the sowing season generally lasts from April to May and transplantation is done in June and July. Water is allowed to remain in the field for the whole period of plant growth, and sometimes drained out just before harvesting. Apart from the springs which are also tapped for irrigation, there are a few small natural tanks. These tanks collect rainwater and people occasionally grow vegetables on their banks. Springs and streams are the main sources of water for domestic use. Care is taken to protect these water sources by allowing undisturbed growth of natural vegetation and banana trees - which are believed to be water-retentive - on their banks. Bathing or washing of clothes is strictly prohibited in these sources. In Kikruma, the use of water for irrigation is governed by rigid rules. The Sedzu river's waters are mainly used for irrigation. As this is a seasonal river, water is almost always in short supply; hence, the right of prior appropriation operates. 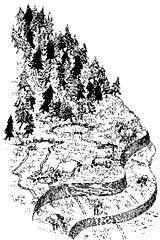 Once a person has tapped the river at one point, nobody is allowed to tap the river immediately above; the tapping is permitted at a distance of two furlongs above. However, no restriction operates on tapping the river immediately below. The laying of a channel is also governed by certain rules. For instance, a person from a different khel (village) would not be permitted to take his channel through lands belonging to another khel. A different combination of water rights may be worked out by the villagers in case the source of water is a spring. If a spring exists on a particular terrace which is yet uncultivated, a person below it would be entitled to use it to develop his terrace. But in case the owner of the uncultivated terrace decides to develop his terrace at some later date, then the two will share the water equally. In general, the rights over runoff between different terraces is respected. The person at the top end of the terrace cannot harness what is legitimately the runoff right of those below. Maintenance work on all channels and catchment areas of ponds is done once every year, usually before the onset of monsoons. The responsibility for mobilising people to clean the channels rests with the last person tapping the channel. He is locally referred to as the neipu, which literally translates as 'the lord'. The system's cost-efficacy also is a point in its favour. A case study of the zabo system with a 14.5 m x 8 m x 2.5 or pond and 0.4 ha paddy land, revealed that the estimated cost was about 750 persondays - equivalent to Rs 1,500. Strangely, this system of water harvesting does not exist in other Chakhesang villages. For the residents of Kikruma, however, "it has always been a part of the village".